Alberto Credi è professore di Chimica all’Università di Bologna e direttore del Center for Light Activated Nanostructures (CLAN), un laboratorio per lo studio di sistemi molecolari fotoattivi avanzati. L’obiettivo della sua ricerca, per la quale ha ricevuto numerosi riconoscimenti in Italia e all’estero, è lo sviluppo di dispositivi, macchine e materiali molecolari in grado di svolgere funzioni utili. Vincenzo Balzani è professore emerito di Chimica all’Università di Bologna. Ha ricevuto numerosi riconoscimenti per la sua attività scientifica, fra i quali le lauree honoris causa presso le Università di Friburgo (Svizzera) e di Shanghai (Cina) e il Nature Award for Mentoring in Science. Alla ricerca scientifica affianca un’intensa attività di divulgazione sul rapporto fra scienza e società e fra scienza e pace. 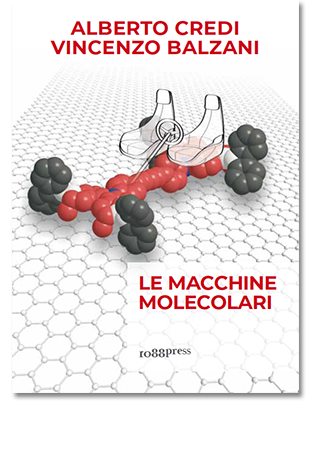 The construction of molecular sized machines is an outstanding scientific result and a primary goal of nanotechnology. In the last thirty years, chemists from various parts of the world have learned to realise simple nanometer machines. Although these minuscule devices have not as yet become an integral part of our daily lives, we are, by now, on the threshold of a new industrial revolution, capable of changing our future with innovative applications of materials technology, IT, robotics and medicine. Alberto Credi is Full Professor of Chemistry at Bologna University, and the director of the Centre for Light Activated Nanostructures (CLAN), a laboratory studying advanced photoactive molecular systems. The aim of his research, which has garnered him many awards, in Italy and abroad, is the development of molecular devices, machines and materials capable of performing useful functions. Vincenzo Balzani is Professor Emeritus of Chemistry at the University of Bologna. He has received numerous awards for his scientific endeavours, amongst which Honorary Degrees from the Universities of Freiburg (Switzerland) and Shanghai (China) as well as the Nature Award for Mentoring in Science. Besides his scientific research he is deeply involved in activities popularising the relationship between the sciences and society and between science and peace.